I’ll admit when I first heard about Isle Of Dogs I assumed it was actually set on the Isle of Dogs in London, perhaps starring those famous pooches from Eastenders, Willie, Roly and Wellard. In fact I was so consumed with what director Wes Anderson could possibly be up to on the Thames, I missed the supposedly obvious joke that the title is a twist on I Love Dogs. Something of a shock, as you know how I love film title puns. It’s also a very male film, though in all honesty I’m not sure I’ve got the word-count to go into that too. 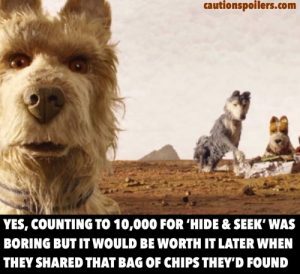 Set 20 years in the future, Isle Of Dogs is certainly an engaging tale. Megasaki City has long been ruled by a dynasty of mayors who loathe dogs. Now an epidemic of snout fever presents the perfect opportunity for the current Mayor (Kunichi Nomura) to banish all dogs to Trash Island, itself a perfect hymn to abandonment with its rusted funfair and piles of car tyres. The head of the Science Party, Professor Watanabe (Akira Ito), does speak up for our canine companions – a cure is on the way – but he comes to a brutal end. Months later, Atari (Koyu Rankin), the Mayor’s young ward, crash-lands on the island in a small plane, looking for his beloved dog Spots. Spots was originally the security detail for the cloistered Atari, or as Spots put it at the time “in other words, I’m your dog”. Despite initially being told by dogs he meets on the island that Spots is dead, reduced to bones in a cage having been unable to escape his locked prison, it turns out this is a case of mistaken identity. Spots is in fact alive, if not necessarily well. The Mayor sends a rescue team for Atari, but he escapes and along with Rex, Duke, King and Boss, the mini-pack he met on arrival, plus stray dog Chief, they set out to find Spots elsewhere on the island. Grey and matted of coat, the fiercely independent Chief (Bryan Cranston) is frosty and suspicious. But he’s also something of a natural leader, chivvying them along when they display a lack of gumption: “”I’ve seen cats with more balls!” he declares. There’s a romantic subplot involving pedigree pooch Nutmeg (Scarlett Johansson), who is sweet and pretty but also knowing and holding something back. Previously a show dog, Nutmeg has numerous tricks but refuses to demonstrate them to Chief straight away. Meanwhile back in Megasaki City, American exchange student Tracy Walker (Greta Gerwig) starts to investigate Watanabe’s death. She’s a blatantly white saviour character, I hope deliberately so; earnest, surly, angry on behalf of her hosts, yet unable to step back and let Japanese people lead the way. It’s a witty film (I liked Chief’s description of “my brother from another litter”), and anyone who has a mud-loving canine will particularly enjoy the cleaned-up and newly blond Chief after he’s given a bath (a twist on the usual trope where a plain woman takes off her glasses and her hair bobble, and is suddenly hot). It’s also rather moving in places. Watching Spots (Liev Schreiber), the first canine deportee, staring trustingly out of his cage as it moves along a wire to Trash Island is harrowing, and overall Anderson’s film is very realistic about suffering. Infected dogs cough and splutter, ears are bitten off, and canine death is a constant, along with the knowledge that they have been abandoned after fulfilling their part of the inter-species bargain as man’s best friend. There is still much surface charm (the backdrops are richly pretty and stylised Japanese), but it’s also delightfully weird – there’s even a kidney transplant. I’m not sure about the dog characterisation. I really only engaged with Chief and Nutmeg, despite the presence of Bill Murray, Edward Norton and Jeff Goldblum as the other three dogs in the little pack; I know one use to be in dog food commercials and another spent his life lying on a blanket by a fire but I can’t remember which (the dogs, not the actors). I find the choices English-speaking directors make regarding dialogue in other languages interesting, and there’s no one-size-fits-all. Films set in mainland Europe during WW2 overflow with generic European-accented English. And in an espionage saga should the ubiquitous furry-hatted Muscovite spies chat amongst themselves in subtitled Russian or heavily accented English? (The Zookeeper’s Wife and Red Sparrow spring to mind here.) But Anderson’s decisions regarding language in Isle Of Dogs are something of a misfire. The Japanese characters’ dialogue is, where it fits with the story, translated – a public speech by Professor Watanabe has an American interpreter. But often we have to rely on gesture, context and feeling to understand what a character is saying. This forces us to engage more, but it also reduces nuance. As a technique it feels rather clumsy and othering, ironic in a film about the othering of a group to justify its banishment. But what about that other question, as the UK school holidays plod on: is Isle Of Dogs a children’s film? It’s a PG certificate, and I did wobble over whether to take my two boys (aged 8 and 6). My 6 year old found it tricky not knowing what the Japanese characters were saying, though he certainly tried to work it out (the mayor was “mad” apparently). He seemed to get more from the film than his older brother; possibly he’s more inclined to go with the flow when presented with a different kind of movie, unlike my more questioning 8 year old. They both really liked the Japanese style and imagery, and the animation (stop-motion, a brilliantly executed breath of fresh air after seeing so many computer-generated Hollywood movies with them). Cultural appropriation is not a phase my two are familiar with, though you could argue the same for many adult reviewers. But films I can take them to see that demonstrate the bonds of genuine friendship are always welcome; and hell, they did love the talking dogs.